Pavee Point started off life as the Dublin Traveller Education and Development Group in 1985. 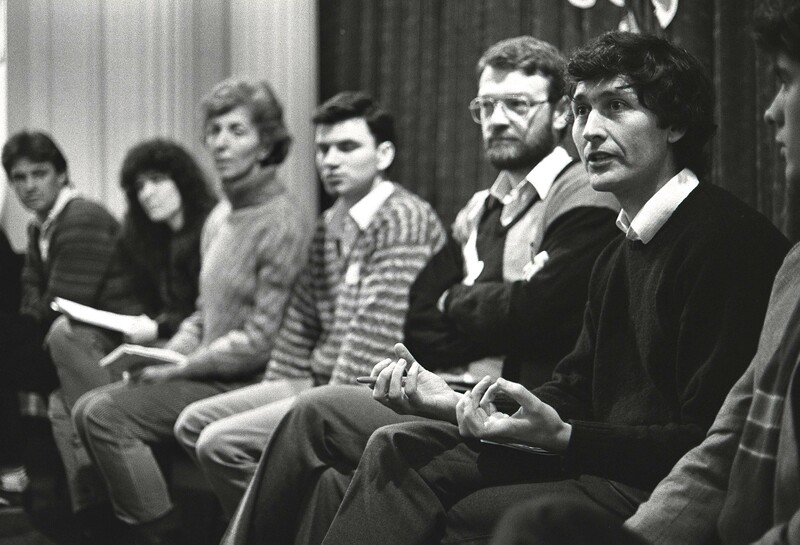 A group of Travellers and settled people began meeting in the winter of 1983-84, with a commitment to the value of collective community development, where people became conscious of their own power and identity, rather than continuing to react to pity and subordination. Over two years, the philosophy and approach of the Dublin Travellers Education and Development Group (DTEDG) was debated, discussed and agreed by the Travellers, community workers and returned missionaries. Finally, with funding secured from ANCO (later FAS) and two rooms loaned by Meath Street Catholic Parish, the first education programme began in January 1985. Community Development is collective, participatory and empowering. It is concerned with the rights of communities to be involved in decisions what affect them, concerned not just with outcomes, but how these are achieved and building on their consequences. It is focused on the development of a more just and equal society with all those women, men and children who are particularly excluded, discriminated against and marginalised. The value of community development is globally recognised and its founding principle of participation has become a key tenet of UN Treaty Body implementation. Community development with Travellers did not start in 1985; previous efforts in Ballyfermot and by Tallaght Travellers Support Group brought issues of eviction and education to the fore. Nan Joyce and her sister Chrissy Ward emerged as strong Traveller leaders. The evictions couldn’t be stopped, but the image of Travellers as outcasts in need of assimilation was challenged. The 1985 education programme run by DTEDG clearly identified discrimination and racism as the issue and community development as the key method to create conditions for addressing it. For the first time, that concrete message was repeated in the media, to the State and in the community. Travellers who emerged from that first education programme went on to become national leaders in their community and in Traveller initiatives. Photo: John O’Connell, the first Director of Pavee Point. The first DTEDG leadership programme, and later initiatives, set out to support the creation of the conditions for community development and solidarity work through direct involvement of participants in actions and initiatives. 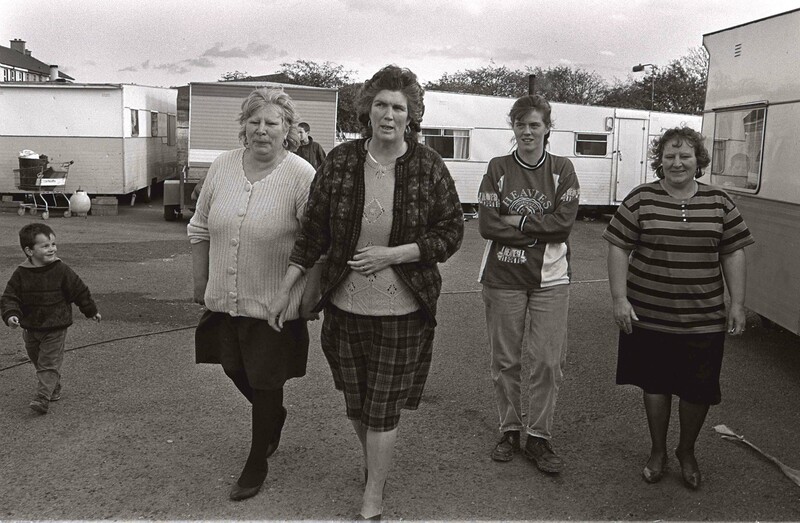 Events for and with Traveller women and older Travellers were planned and organised, dramas with Travellers depicting Traveller life were practised and performed, and solidarity actions undertaken with the Dunnes Stores workers anti-apartheid strike and the miner’s strike in the UK. Local issues including evictions were directly addressed and participants engaged actively in meetings of the National Council for Travelling People, an established national umbrella organisation for local Traveller committees. The community work approach and its underpinning principles of empowerment and participation was not hard for Travellers to identify with, but it was hotly contested by local committees and professionals using social work methods which individualised both the problems and the solutions. This thinking and its associated pathologies remain evident in some work with Travellers. For some issues, social work and counselling are appropriate interventions; but then and now it’s important not to confuse them with community development or collective empowerment. DTEDG sustained its community development work, as did other community groups in that decade, through funding from a variety of sources. Over the first five year period the key features of DTEDG’s approach to community development with Travellers were tried, tested and established. From the outset, DTEDG was clear that Travellers are not a homogenous group but rather women and men, predominately young but also with some older people, and while marginalised and mainly unemployed, with their own internal hierarchies and divisions like other communities. Creating the conditions for collective community development interventions involved social analysis education to support participants to get beyond responding to symptoms to identifying and to address the causes of discrimination, exclusion and poverty. Building a critical mass for change was a key Pavee Point priority for the 1990s. Support was given to initiatives around the country to use a community development approach to address discrimination and realise Traveller rights using European and national funds. In this way new initiatives, in Galway, Donegal, Limerick were helped to emerge and existing projects were given ongoing solidarity support and information regarding opportunities. The 1990s also saw increased movement of Roma to Ireland as asylum seekers. Pavee Point recognising the need for solidarity with their similar struggles began working with them and creating space in Pavee Point for their activities. This work continues through the Roma Project and through integration of Roma in all Pavee Point future plans. Photo: Maggie McDonnell, Missie Collins, Tessa Collis and Bridgie Collins. It was clear also by the 1990s that changes required for ending discrimination against Travellers needed support beyond the national level and that Travellers, as well as Roma, needed to be recognised and acknowledged in international initiatives. Pavee Point workers played active roles in the formation of the European Anti Poverty Network and the European Network against Racism. Submissions were made to UN Treaty bodies and major UN conferences attended and actively engaged with. Outcomes achieved with others included the naming of Travellers in the concluding documents of the UN Conference against Racism and in Council of Europe initiatives including the European Roma Traveller Forum. This work has continued with a particular and ongoing focus on recognition of Traveller ethnicity, discrimination in policy and practice and lack of implementation of reports and recommendations. This sense of community development and collaborative, participatory work continues through to the present day in Pavee Point, where community development principles underscore the work of all programmes.